Sunday Assembly holds service as a key part of our mission and identity. We are an organization comprised entirely of volunteers and believe that Sunday Assembly San Diego can be a dynamic force for change. The Service Outreach Program is dedicated to serving the community of San Diego as well as the individuals who join us every month for our assemblies. Our goal is to provide a wide variety of opportunities that fit various personalities, serve the diverse demographic community of San Diego and provide opportunities for assemblers to connect with one another. Come out and help us clean up the beach/park at South Shores (right next door to Sea World)! 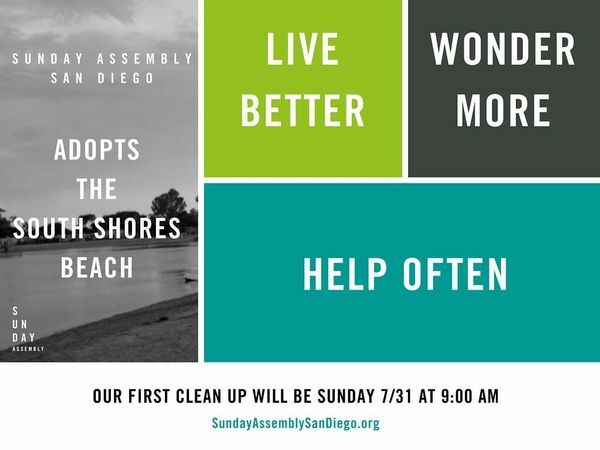 Sunday Assembly San Diego is adopting the beach at South Shores through I Love a Clean San Diego's Adopt a Beach program, joining more than 10,000 volunteers across the County helping to keep our coasts clean. This will be the first of (at least) three cleanups in the next year. All supplies will be provided - bags, gloves, etc. However, if you have them, please bring a reusable water bottle (We'll have a cooler on site for fill-ups), gloves or buckets to help us reduce waste generated by the event. Close-toed shoes, sunscreen and a hat are recommended. In partnership with Stand Up For Kids we are making meals for youth and their kids. You can either sign up to make a meal and drop it off or make a meal and serve it as well. We need two entrees, three side dishes and two deserts. Whatever works best for you!